The Potteries – Officially recognised as the World Capital of Ceramics, The Potteries has award winning museums and visitors centres. Visit the Emma Bridgwater factory, Port Merion, Wedgewood to name just a few. 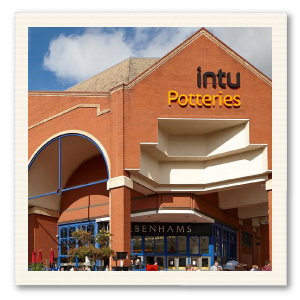 If you are looking for something other than pottery then visit intu Potteries, boasting big names including Next and Debenhams intu Potteries is the largest shopping centre in Staffordshire and South Cheshire. New to intu Potteries is The Hive comprising of 7 restaurants including Nando’s, Chiquito and Gourmet Burger Kitchen it also has a 9 screen Cineworld cinema. Trentham Estate – A brilliant family day out! Visit the award-winning Trentham Gardens with the Giant Dandelions and Fairies or shop at the Trentham Shopping Village along with the Garden Centre it’s perfect for shopping. Walk with 140 Barbery macaques at the Monkey Forest or take a tight rope adventure at Aerial Extreme. Trentham has everything for all the family.